Note: We have eliminated references to Varsity Scouting in the text below (which appear in the requirements posted on Scouting.org), since that program was discontinues in 2018, and we have added references to Sea Scouting since it is now separate from Venturing. The Emergency Preparedness BSA Award, first introduced in 2003 and updated in 2014, was designed with the aims mentioned above in mind. The award has been earned by tens of thousands of Scouts and Scouters individually, with their unit, or at a large event such as a jamboree. By developing these lifelong skills, Scouts have been instrumental in helping their communities recover from emergencies. Scouts and adult leaders can earn the individual Emergency Preparedness Award. Meanwhile, units, districts, and councils can work toward earning the bronze, silver, or gold achievement level. The awards are available at local Scout shops once specific requirements for each rank or achievement level have been met. When a member has fulfilled the requirements, a completed application is submitted to the council. Upon approval, an Emergency Preparedness pin is awarded. The pin may be worn on civilian clothing or on the uniform, centered on the left pocket flap. The award may be earned more than once; for instance, as a young person advances through the ranks and is capable of more complex preparedness activities, but only one pin may be worn. Separate age appropriate requirements have been developed for Tiger Cubs, Wolf Cub Scouts, Bear Cub Scouts, Webelos Scouts, Boy Scouts, Venturers and Sea Scouts, Unit Volunteer Scouters, and District/Council Volunteer Scouters. Take a nationally recognized first-aid course geared toward children such as American Red Cross First Aid for Children Today (FACT). Participate in creating an emergency plan for your home and for your troop's Scouting activities. Be sure you know the details of both emergency plans. With your troop, including its adult leaders, participate in emergency preparedness training conducted by community emergency preparedness agencies. Complete IS-100.b, Introduction to Incident Command System (see http://training.fema.gov/IS/NIMS.asp ). Plan and execute an emergency preparedness training event for a pack or troop. This award is available to all registered Scouters who serve a unit, including all leaders and committee members. The unit members create an emergency action plan for unit use during regular meetings, tours, and activities. See https://filestore.scouting.org/filestore/doc/680-029.doc . Greater than 40 percent of registered adults are trained in Safety Aﬂoat and Safe Swim Defense. Mandatory for troops only: All youth members with a driving permit or driver’s license have earned the Traffic Safety merit badge. Mandatory for troops only: Greater than 40 percent of registered Scouts have earned the First Aid merit badge and are certified in CPR/Wilderness First Aid. Mandatory for Venturing crews and Sea Scout ships only: All youth with a driving permit or driver’s license have taken Venturing Out: Keys to Safe Driving online or attended a group presentation of the Risk Zone: Transporting Scouts Safely. Smart Choices: driving, drugs, and alcohol is a presentation discussing the dangers of drinking and Driving. Download the presentation here . The speaker’s notes can be printed from the presentation, or may be downloaded separately as a PDF. Mandatory for Venturing crews and Sea Scout ships only: Greater than 40 percent of registered crew or ship members are trained in CPR/AED by a nationally recognized agency such as the Emergency Care and Safety Institute, the American Red Cross, or the American Heart Association. Mandatory for troops/Venturing crews/Sea Scout ships only: Greater than 40 percent of registered Scouts and adults have completed IS-100.b, Introduction to Incident Command System (see http://training.fema.gov/IS/NIMS.asp ). Individual or bronze, silver, or gold awards are available at Scout shops once requirements for the award have been met. The pin may be worn on civilian clothing or on the uniform, centered on the left pocket flap. 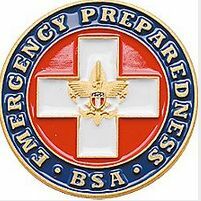 Emergency Preparedness BSA pin, No. 00540 (civilian wear/uniform, centered on left pocket flap). Awarded when requirements are met. Only one pin may be worn.